You never know what kind of weather you might get in the wonderful Show-Me state; especially in the southwest corner. Some people are fine staying inside for months wrapped in blankets in front of the television, but others like myself like to get out as much as possible. Whether it’s 60 degrees or 23 there are a myriad of things to do and enjoy in nature. The many benefits of exposure to sun and natural landscapes are widely known, but for some people, figuring out what to do when it’s not swimsuit season can be quite a task. Let me share a few ideas. Maybe you’ll discover some new activities to fall in love with in our beautifully diverse state. Winter is a perfect time to star gaze. A “super blood moon” eclipse is expected to be on full display January 20th. A lunar eclipse isn’t a rare event, but this beauty will be happening at its perigee, meaning the moon will be at its closest point to Earth in its orbit. Bundle up, pack some hot coco and experience this fantastic event under starry skies. Winter is also a great time to hike. One of my favorite things to do is hike in the snow. The woods are so beautiful in winter; whether there is snow to cover it or not. You’ll see more squirrels and birds because the leaves have fallen off the trees and no longer block your view. If you do happen to get some snow, you can investigate the track stories. Follow the animal tracks. Take photos or draw them in your nature journal. Some tracks tell amazing stories! A bird watching station can be as simple or elaborate as you like. You can put out a bowl of sunflower seeds or you can make your own feeders. Either way, you’ll enjoy hours of entertainment watching birds visit your little restaurant. You can find several recipes to make your own suet online but one simple recipe is to melt 2 lbs of suet (can get from the butcher) on low heat, add ½ cup of crunchy peanut butter, then stir in ½ cup of sunflower seeds. Pour into a 9x13 cake pan and allow to cool. Cut into cakes. Use immediately or store wrapped in the freezer. A bowl of water is also a good idea. Kids love to write their observations in nature journals. Nature journals are fun and easy to make. You can simply decorate a spiral notebook or make your own with a lunch sack and paper. What you put in your journal is up to you; whether you write or draw or do a combination of both. One helpful way to remember your days’ events is to date each entry and add your location. You can also add what time of day it was and the temperature if you’d like. It’s nice to return to the same location many times as you are guaranteed to see new things each time. You can also use some of the beautiful items that you may have found on your hike to make natural crafts. 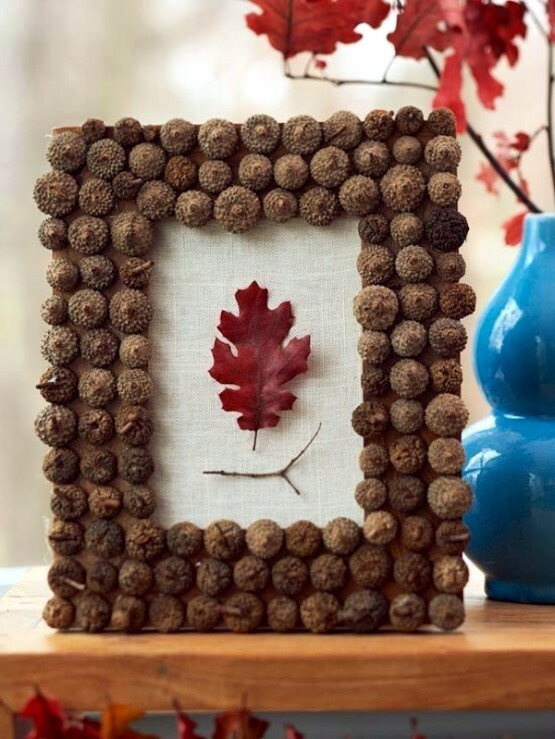 Besides peanut butter on a pine cone for your bird watching station, you might collect interesting twigs or acorns and make a frame. Use your imagination! Even places you visit or pass often can be a beautiful new experience after a snow. Combine 2 heaping cups of fresh snow with a tablespoon of sweetened condensed milk and a tablespoon of root beer or cola for a snow cream float. Whatever you do this winter, I hope you can make new memories and explore what our wonderful state has to offer. Brandi Petty has been a Missouri Master Naturalist since 2016. She teaches conservation education for the state of Kansas at Southeast Kansas Nature Center. Posted on January 12, 2019 by ann butts.